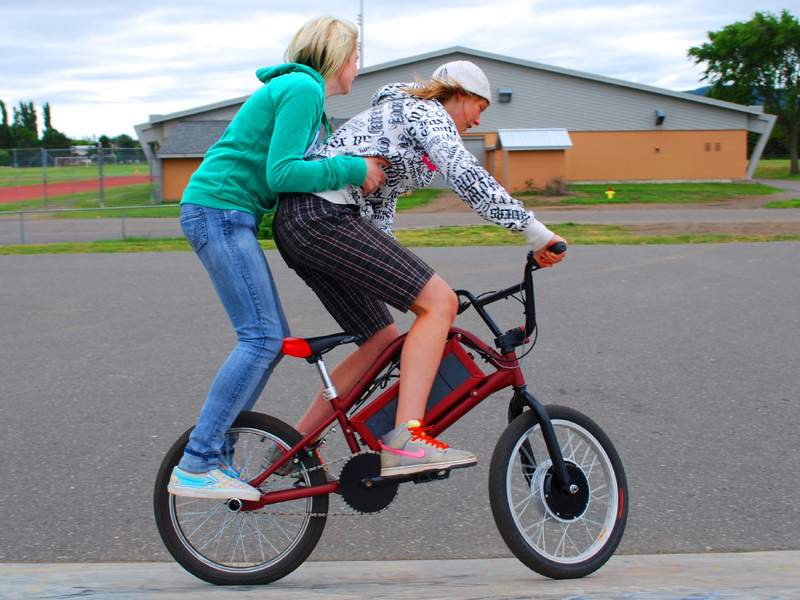 A Fast and Fun Electric Powered BMX You Can Make. It's part electric scooter and part freestyle BMX, creating a super fun and durable electric bike that will go anywhere. You can pedal or let the electric hub motor do all of the work. 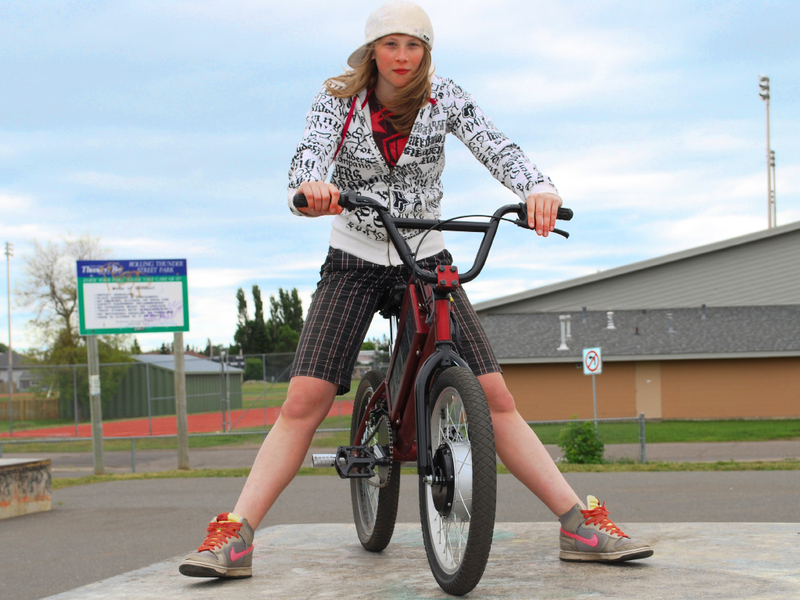 The Bike will race up hills, run off road, and get you around at the speed of city traffic. 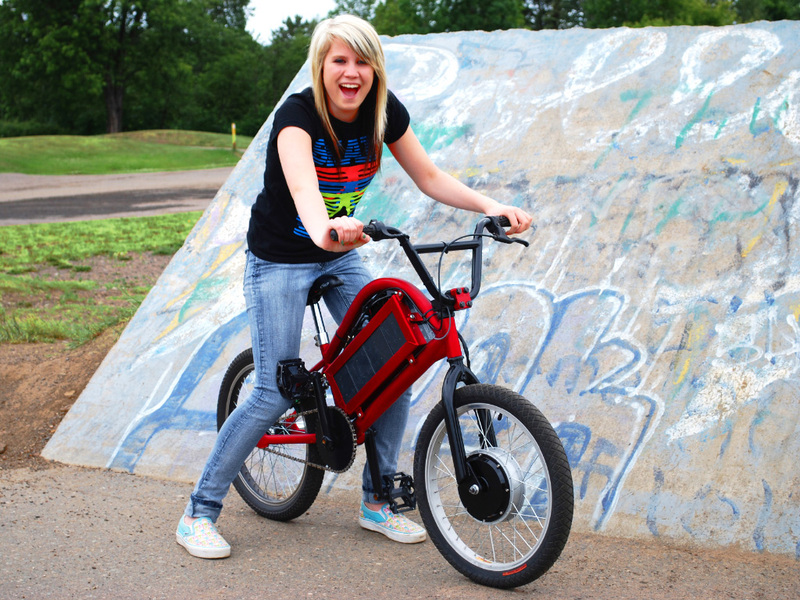 Built on a modified BMX frame, the completed electric bike will take a beating and keep on working. This is a great trail bike for camp as well since it is completely silent running. 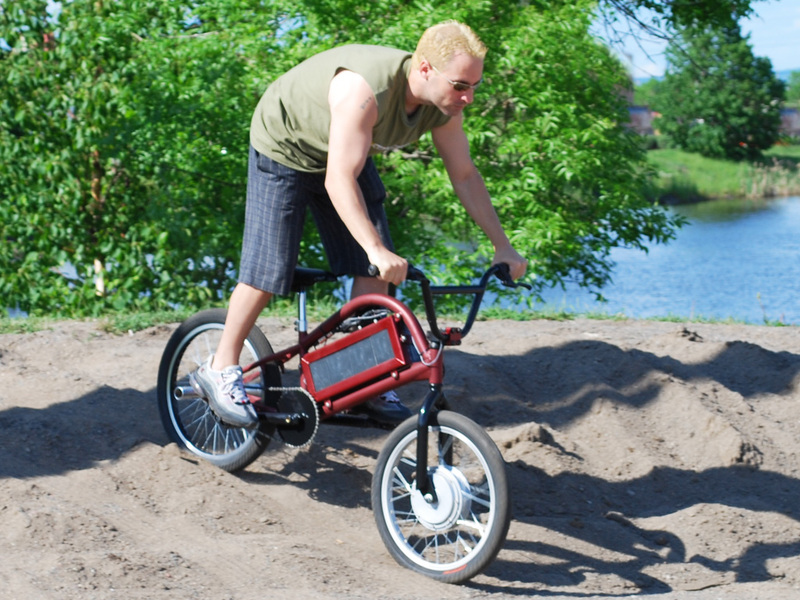 You can make your own cool electric BMX using just about any type of frame, even a much larger bicycle like a mountain bike. The pedals are optional, and you can add a much larger battery for a longer range DIY electirc vehicle. You Only Need Basic Tools and Parts to Make Yours. We design our plans so that anyone with a desire to chop can make their own fun DIY electric bike. Every single step of the build is shown in great detail, and the plans assume you have only the basic tools such as a hand drill, angle grinder, or any basic welder. Modify the plans easily to suit your needs, using the parts you have on hand to create your own unique silent running electric BMX scooter. The frame is easily modified to take a decent sized battery pack that will allow the cranks to remain in their original position. You can experiment with inexpensive gel batteries or lithium batteries to get the distance and power suited to your budget. Ride on The Street, Off Road, or on The Bike Path. Electric power is silent and loaded with great acceleration for a responsive and fun ride. Even the smallest hub motor kit will propel you up hills with ease, even if you don't pedal at all. This freestyle electric bike will blend in at the skate park and then run perfectly at the dirt bike riding pit, and you can get there on the city streets with no license required. A totally silent electric bike also lets you run where no dirt bikes are allowed, getting by on stealthy electric power. You can utilize hardware store tubing, scrap bike frame tubing, or any other thin walled steel tubing you have on hand. The battery box is made to be swapped as well, so you can double your riding time by having one pack on charge at all times. Looks Good, Moves Fast, Makes Zero Noise. 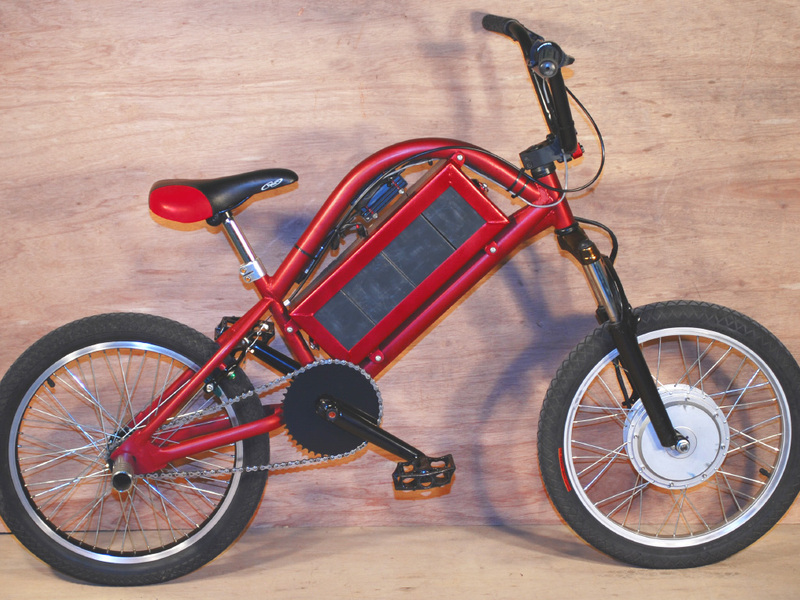 Depending on the choice of hubmotor and battery pack, this DIY electric bike could easily keep up to a similar sized gas mini-bike. Electric power is extremely fun, putting out massive starting torque, and reaching full speed with no sound at all. Long range commuting is possible as well, using the motor in combination with your human power to combat hills, beat the headwind, and keep up a good pace. The battery pack is easily swapable, and you can build your battery bank using either standard gel batteries, or with newer technologies such as lithium ion for maximum power delivery. All batteries charge from a small DC wall adapter. Stunt Bike, Dirt Bike, and Electric Scooter. This rugged DIY electric conversion can take a beating, so it will perform well on just about any terrain or track. Even at high speed, this DIY Electric BMX handles well, and with standard bicycle brakes, it has plenty of stopping power. The electric hubmotor can be installed on the front or rear wheel, or for crazy power, you could install hubmotors on both wheels. The battery bank is also easily customizable for a balance of speed and distance. Removable Battery Pack for Longer Run Times. The era of electric power is here at last, and there are many types of hubmotors and battery types available. Newer and lighter battery types such as lithium ion are becoming more affordable, and you could make more than one bank for all day riding. The battery box can be removed from the frame using just a screwdriver, allowing hot swapping of a charged pack in just a few minutes. Since the hubmotor is available as a kit, connections are as easy as plugging in the connectors. You can also modify the wiring to adjust your throttle position or battery pack type. Installing a hubmotor does not require any special skills. Powerfull enough For Huge Hills, or Two Riders. Depending on the size of hubmotor you choose, output power will be between 2 and 4 times that of just your legs alone. With all of that extra power, you can easily carry a passenger on the pegs, or add some kind of cargo trailer to carry your gear or a much larger battery pack. If you enjoy changing things up, you could even find a second donor bike and create a fun electric tandem scooter hybrid. 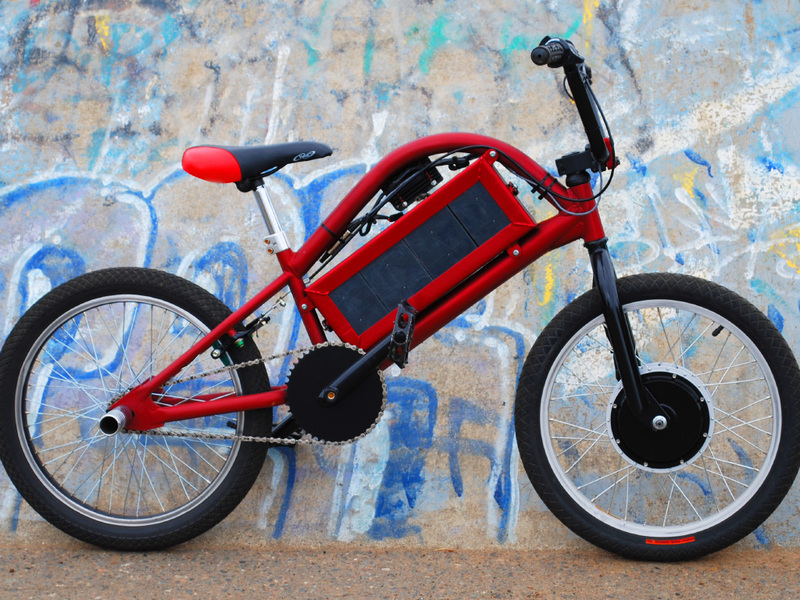 There is plenty of room in this DIY Electric Bike Plan to change just about anything from the shape of the frame to the size of motor and battery pack. 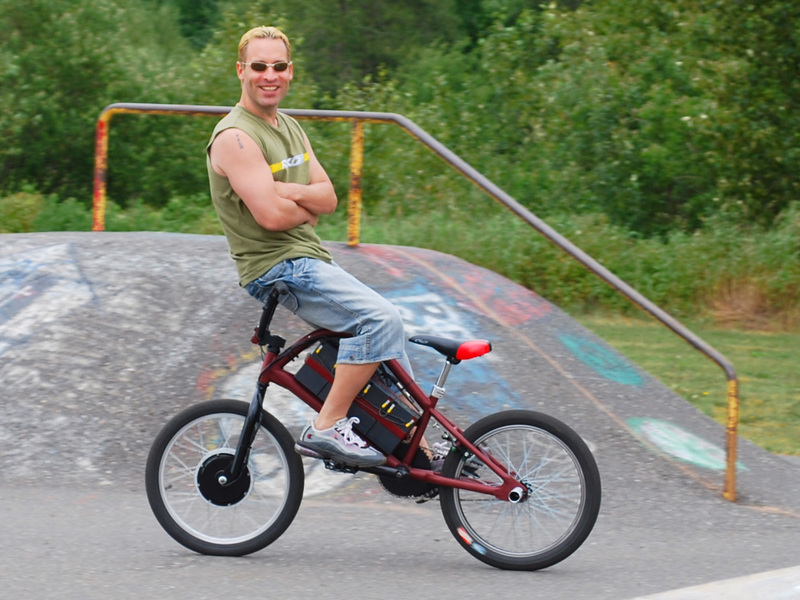 You can convert any sized bicycle to electic as well with a motor on the front or rear wheel. An Electric DirtBike That Packs Into a Car Trunk. This fun DIY Electric BMX is no larger than a regular bicycle, so it can fit on a bike rack or car trunk for easy transport. The battery bank contains no spillable liquid, so you can lay the bike down for transport or storage. There is no petrol smell either, so store your bike indoors safely. Batteries are charged from any wall outlet by simply plugging in the charging adapter that comes supplied with all bicycle hub motor kits. Forget about noisy gas powered scooters and minibikes! Like the dinosaur, their time is now over, and the mighty electron is now the king of personal transport. 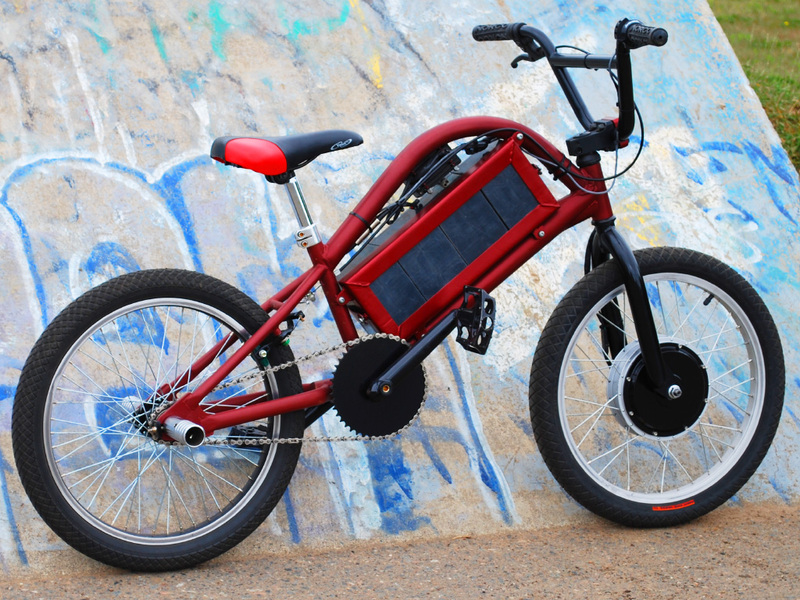 Running completely silent an clean electic power lets you ride anywhere, anytime on your DIY Electric Bike.